I attended (most of) the School District 67 meeting last night on school closures. 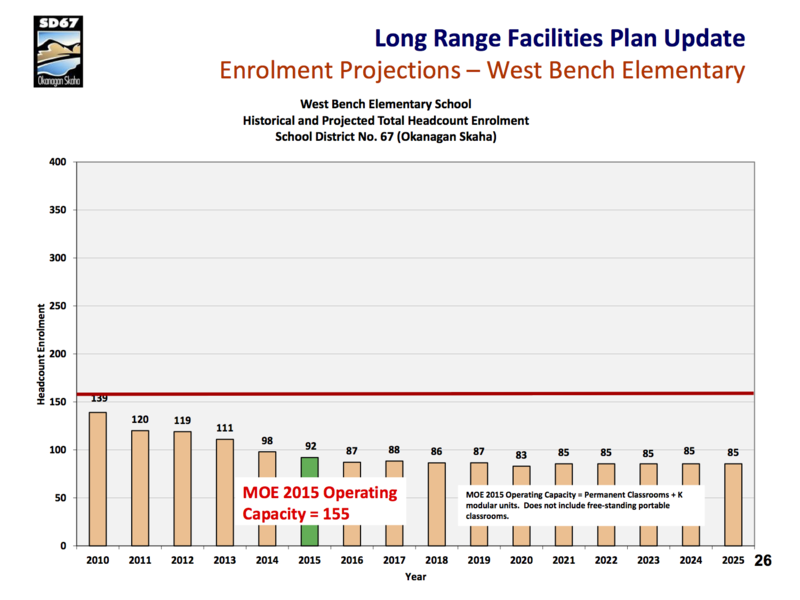 The student enrollment projections for West Bench Elementary (click image on the left for a larger version) paint a very pessimistic picture. I have a strong attachment to the notion of a neighborhood school: all three of my kids walked to West Bench Elementary every day when they were that age. I rushed home following the presentation and composed an email to the SD67 trustee for the West Bench, Ginny Manning (posted below). My fear is that the RDOS has not done a good job articulating (or even considering) a pro-growth strategy for Penticton's rural fringe. Most of our efforts--and perhaps rightly so--have been anti-growth (e.g., limiting urban sprawl and directing growth to a few established areas; see the Regional Growth Strategy for more information). Details of the various closure proposals for schools can be found on the SD67 website. The background for SD67's analysis (including the interpretation of regional growth patterns and enrollment projections presented to the public on October 14th) can be found here. I thought tonight's session was very good. As I said publicly--though perhaps not eloquently--I am very impressed by the range of permutations and combinations that SD67 has considered. No one doubts that tough choices need to be made. My primary concern as the director for Electoral Area F is that the population projections for the West Bench extrapolate from current growth. The West Bench is due for a much-needed update of its official community plan and I expect to see a fundamental rethink of its configuration in the future. Many of the homes on the West Bench were built for veterans in the 1950s and 60s on 1.6 acre lots to support small-scale agriculture. Clearly these houses are getting old and the underlying business model is long gone. Yet the lots themselves have high intrinsic value: they are close to town, many have excellent views, there are no ALR constraints, and core infrastructure (other than sewer) is in place. Opportunities exist for pockets of higher-density development and infill. Unfortunately the lack of sewer is critical since no subdivision can occur without it. We are thus one sewer line away from a significant increase in density on the West Bench. Some level of growth in our broader community is desirable. Penticton is aging in place while our peers (in particular West Kelowna and Lake Country) are adding young families. This lack of broad demographically-balanced growth is the root cause of your problems at SD67 and should serve as a wake-up call to those of us in local government. The evidence suggests we have the wrong housing mix at the wrong price point in Penticton. But how do we add housing supply in a town surrounded by lakes, steep hills, ALR, a landfill, and the PIB? When I look at a map I can't help but see the greater West Bench and upper Wiltse as the most likely areas for growth in greater Penticton. This might not be apparent to a consultant from the outside looking in because the City of Penticton does not generally include land outside its municipal boundary (e.g., the West Bench, the PIB) in its strategic growth plans. As such, SD67's enrollment projections for the West Bench almost certainly underestimate the neighborhood's potential for growth. Of course the shift from rural-residential stasis to suburban growth will require political and economic acts of will by residents of the West Bench. But I think your presentation tonight will cause a lot of people up here to rethink their priorities for their neighborhood. In that sense growth on the West Bench is more likely now than it was a week ago. In case you have ever wondered what sewer might cost for the greater West Bench, a study can be found here. I have updated the very rough cost estimates from 2005 to account for inflation. There will be a public forum at West Bench School on Dec.1st at 7pm. All residents of the West Bench are welcome to attend. School building closures will be announced on Jan. 20th, 2016.